Parents and young players know all about the batting tee. It’s just a version of hitting a tee shot in golf. The ball just lies there, suspended in space, and that’s how very young players first learn how to hit in baseball. But the G Tee Batting Tee is much different, as it offers many advantages that even professionals will appreciate. The G Tee High Quality Baseball Batting TEE Adjustable 26"-53"
The makers of the G Tee aren’t the ones who first came up with the idea of a professional batting tee. But they took note of what other batting tees offered, and they made it better. One of the competition they looked at was the Tanner Tee. This is why G Tee Batting Tee reviews are generally positive, and why the only negative reviews on the G Tee is about how similar it is to other designs. But the truth of the matter is that this is an excellent and unique design that offers many outstanding features. First of all, it is extremely durable, which is after all a necessary feature when you swing an aluminum bat at an object. You won’t have to worry about your bat or your hands, if you miss and hit the batting tee instead. That’s because the cup that holds the baseball (it can also hold a softball too, by the way) is made of rubber. Side note: Remember safety! Don’t just hit off the tee in your backyard at your neighbors house! Hit at the field, into a net or even inside a baseball batting cage. The rubber cup won’t collapse at all, even though you hit it thousands of time. You’ll probably become a better hitter after using this constantly, and so you won’t hit the rubber cup as often. But even then, after you use it you can always lend it to other hitters who need to work on their swing mechanics. Even if they start hitting the rubber cup constantly, you won’t have to worry. In fact, you don’t need to worry about the quality of the build, because it’s made in the USA with high quality materials. For the base of the batting tee, the material used is tough polyethylene that won’t ever warp or fade. The engineering standards used for its construction are very stringent, and on the finest materials were ever used. The shape reduces “catapulting”, and at the same time you can stabilize it further by putting an option 10-pound weight plate on the weight post. There’s also a quick change stabilizer and lock pin at the center of the base so that the upright is held securely in place. You’ll need to assemble and disassemble the batting tee, but that only takes a few seconds. That means you can easily take it anywhere. There’s also the telescoping feature that helps hitters tremendously. The model GT2653 can be adjusted from 26 to 53 inches. 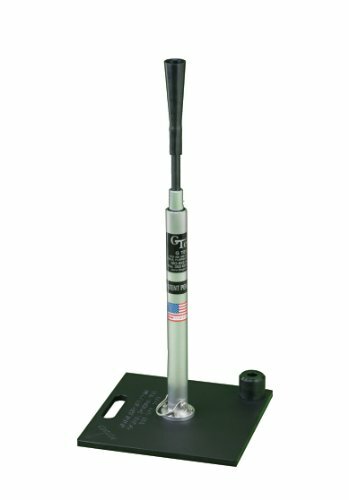 If you want something shorter than the G Tee (26-53) Professional Batting Tee, there’s also the model GT2241 that adjusts from 22 to 41 inches. Now if your training involves low ball drills, you can also get the optional 16-inch or 19-inch model low ball attachments, which can be used on your G Tee standing upright. Essentially, what the G Tee Batting Tee offers is a great tool that can help you active more effectively so you become a better hitter. Let’s start with one obvious advantage: its telescoping adjustment. The most common mistake with batting tees is that players adjust it to their waist high position, and they keep swing at this ball position until they get tired. Maybe some of them at least think about moving the upright from the inside to the outside, so there’s some variety. But that severely limits the usefulness of the G Tee (26-53) Professional Batting Tee. You need to realize that strikes can be high up or down low in the strike zone. What that means is you can use the batting tee so that you’re not merely good when the ball is waist high. You can also take good swings with strikes at the knees or high up in the letters of the uniform. Then we come to its second obvious advantage, which is its durability. Everyone can make mistakes, and in fact the purpose of the batting tee is to eliminate those swing mistakes during actual play. Here, when you make mistakes, you hit the batting tee. If it’s an inferior-quality batting tee, then after a short while it becomes a ruined mess after all those hits. But you can swing away with the G Tee Batting Tee. The rubber cup protects your hands and your baseball bat. And it’s tough enough that it can take thousands of hits. In fact, when you hit it, you won’t even have to readjust its height. That is maintained even after a hit. As for the drawbacks of the G Tee, the main problem is actually about batting tees in general. Some of the older baseball players may find it childish to use, while others may consider it boring. After all, the ball is not hurling or spinning though the strike zone. It’s just sitting there. But you can always go online and get stories about how MLB players use it constantly. You should also show them online batting tee videos of actual pros using the “boring” batting tee for everyday use. Why do they think that the makers of the G Tee bothered to make a professional batting tee? That’s because the pros use them too! In fact, besides the multitude of professional baseball players that use the G Tee batting tee there are also college baseball teams, womens softball teams, high school teams and normal players like you and I.
Click this link to watch my G Tee Batting Tee video demonstration. Yes, I hit the ball into the grass but it was my fourth take! Watch the base of the tee and how solid it is. And if you’re a player, you need to use them as well. Its use lets you perfect your swing mechanics so that you improve your muscle memory. Your body automatically responds when the ball in a real game passes a spot in the strike zone that you practiced with a tee. And that’s why you need the G Tee Batting Tee. It’s tough, so even if you miss and hit the tee instead it can take the abuse. And in fact, with constant practice you start hitting the ball more frequently. With its adjustable height, you can practice your swings from balls up high and balls down low. And of course, you can just move it so that you can practice hitting on the inside and on the outside. With practice, you become better, and there seems to be no better batting tee than the G Tee.